About a year ago, JustDesign was contracted by Global Hope Network International (GHNI) to build an inexpensive, open-source well siting meter for water borehole drilling. GHNI’s West Africa team had recently received new drilling equipment, but had hit rock on both of their initial attempts, and needed a way to determine the best spot for future digging. Commercial well siting meters were not an option due to high costs, which can range from $3,000 to $10,000 per device. Fortunately, a set of 2016 papers by James Clark et al. described several inexpensive devices for discovering underground water, including GHNI’s preferred option, a resistivity meter. JustDesign’s task was to recreate, and if possible, improve upon the designs proposed by Clark. 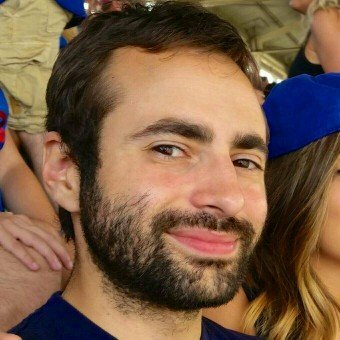 This post describes the process that resulted in the latest version of our meter, as well as instructions for building your own. Safe drinking water is in especially short supply in sub-Saharan Africa, where more than eight in 10 don’t have a piped source, forcing individuals (typically women) spend hours each week collecting water. This is true even in communities with untapped groundwater potential, which could be used to increase the supply available for consumption, sanitation, and irrigation. Given the proper equipment, wells can be drilled with high accuracy, but locating groundwater without a siting meter is a notoriously difficult process (the field even has its own popular pseudoscience). 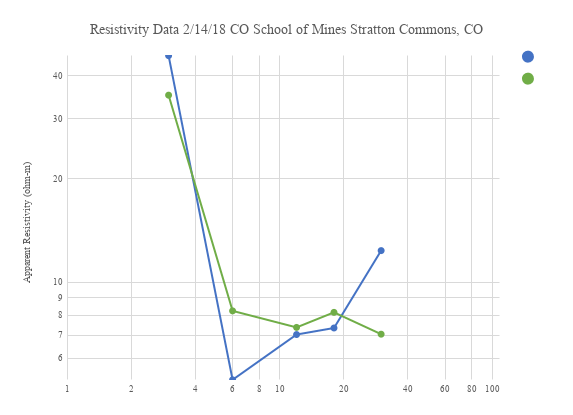 Actual siting methods, using resistivity and seismic technology, can be combined an understanding of local geology to produce detailed subsurface maps. Resistivity meters are a popular option for well siting applications. 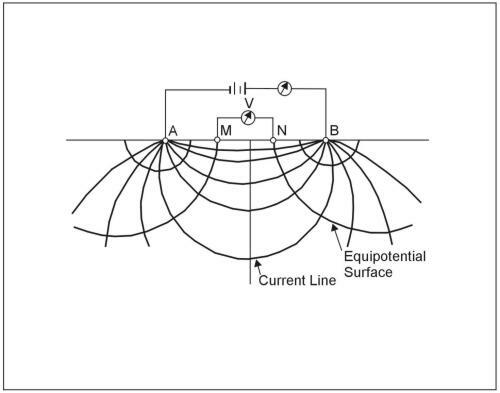 They work by creating a high voltage potential to the ground surface, and using probes to measure the induced current and voltage, from which the resistivity can be calculated. Abrupt changes in resistivity are often indicative of the boundaries between underground layers, and potentially the presence of groundwater. 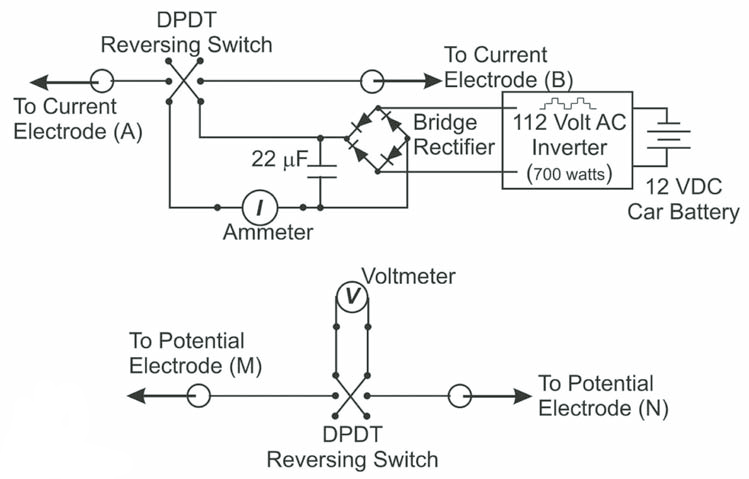 As designed, the system supports an electrode distance of 250 ft (~75 m). Each spool of wire was cut into two sections of 375 ft and 125 ft, making four total segments. Electrical clips (one large and one small) were then soldered to the ends of each wire segment. 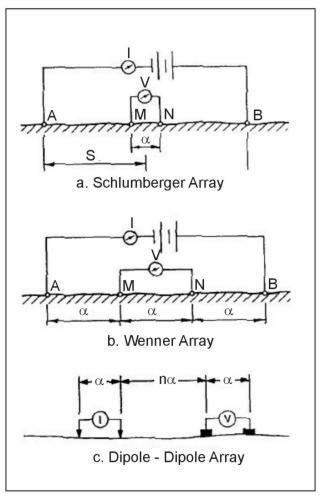 When siting, the large clips are connected to the electrodes, and the small ones to the switching box. To create the electrodes, the 8 ft grounding rod was cut into four segments (of at least 1 ft in length) using a hacksaw, then sharpened at one end to make them easier to drive into the ground. The inexpensive Harbor Freight meters would consistently break when used as the current sensor, spoiling the data from several test runs, and requiring the purchase of a costlier meter for each setup. The Harbor Freight design (seemingly reused in all cheap multi-meters) also has an issue with decimal point placement when switching between (the already confusingly labeled) measurement modes. Just avoid this meter and anything that looks like it. Although the switch box was originally designed to use banana jack connectors/posts, I was never able to locate an inexpensive male banana connector to attach to the end of each wire. Using the small clips from the Harbor Freight package worked well enough, but the movement of the relatively stiff wire occasionally shifted a clip and caused an electrical short (potentially responsible for some of our multi-meter issues). The most problematic aspect of the v1 testing process has been the inconsistent and occasionally confusing results. While this can be partially attributed to the Harbor Freight meters and potential connectivity problems, other test results have sharply diverged from baseline measurements (either in the form of previous borehole logs, or direct comparisons with COTS siting meters) without any obvious malfunctions. 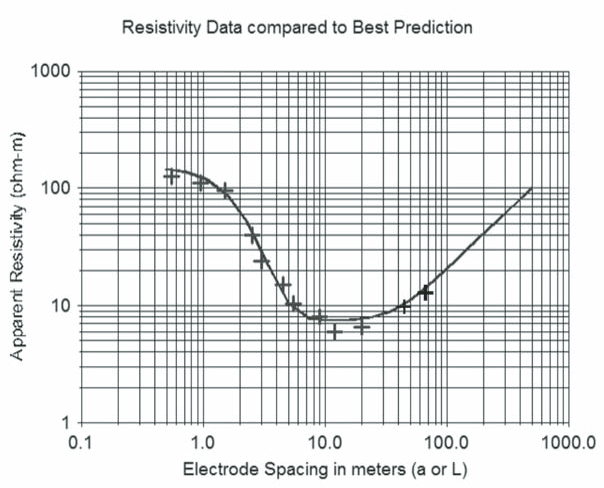 To overcome the limitations of our earlier resistivity instrument, our newer device includes an Arduino microcomputer that measures the current and the electrical potential and controls three relays that replace the manual reversing switches… An advantage of this instrument is that 50 or more measurements can occur at each current direction, readings are taken at precisely the same times, and many reversals of current can occur. 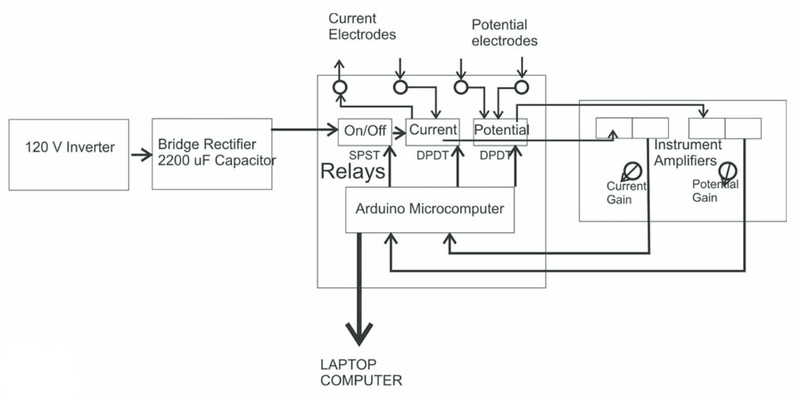 Averaging of the multiple samples greatly improves the signal-to-noise ratio, and a laptop, connected to the Arduino, processes the values obtained by the Arduino microcomputer. When I emailed Dr. Clark to ask for details on his new design, however, he explained that the current iteration of the “improved” device was unstable, and that they had so far been unable to trace down the root cause (as of May 2017). 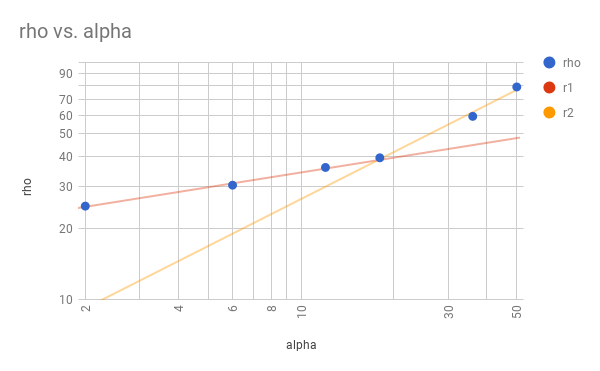 Given the tight schedule for our development, we decided the best option was to proceed with our own automated version (v2), based on Clark’s “improved” design. In addition to the on-board Arduino Pro Min (to control the DPDT relays), and instrument amplifiers (for voltage/current measurement), the v2 design also includes a DC-DC boost convert, capable of taking the 12V battery input up to 75-150V, and a 16x2 LCD display with two buttons, for the user interface. Check out the full project on Github, the BOM on Octopart, and the board at Oshpark. We’ll be presenting the v2 design at the upcoming EWRI World Engineering and Water Resources Congress 2018 in Minneapolis, and plan on some initial field testing in the weeks leading up to the conference. 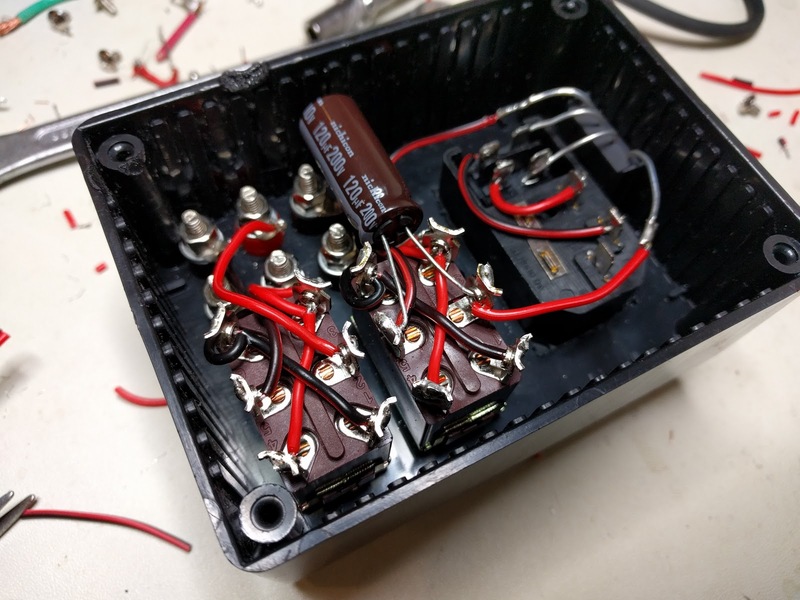 Initial bench top test results indicate that the (rev A) on-board boost converter is slightly underpowered, and high-power measurements might cause the voltage level to dip, which will be addressed in an upcoming design change if it causes any issues. Once testing is complete, we plan on sending the first batch of v2 meters to our partners worldwide. 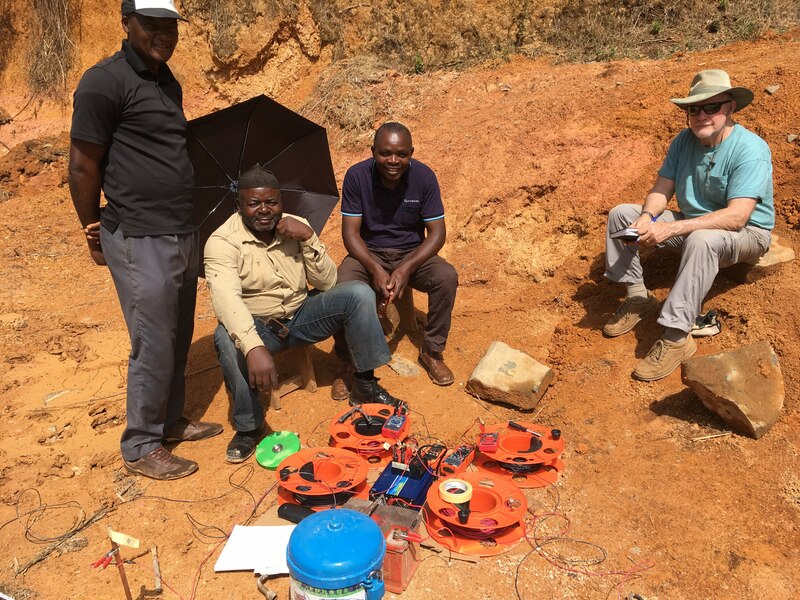 Pictured from left to right: Eric, the well owner; Eugene, program manager and geologist; Lazarus, geologist, and Chuck, geologist, test the prototype of the resistivity meter in Njavnyuy, Cameroon.